Body Attack ARGININE ZERO stands for high-dose and 100-percent pure L-arginine and does therefore not include any other compounds such as hydrochloride (HCL). ≙ 18,99 € ✔ Delivery time 1-3 working days within Germany. 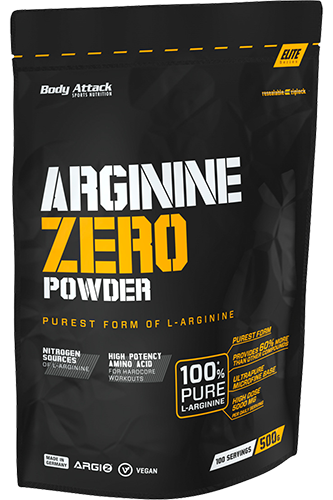 Body Attack ARGININE ZERO stands for high-dose and 100-percent pure L-arginine and does therefore not include any other compounds such as hydrochloride (HCL). This makes ARGININE ZERO one of the strongest and most highly dosed L-arginine products on the market. The purest form of L-arginine does not provide any acidifying compounds, enabling a better absorption by the body. The added vitamin B6 supports the protein metabolism and reduces fatigue during workouts. ARGININE ZERO is your ideal companion for intensive and strenuous training phases. The supplement market for athletes primarily offers L-arginine mono-products or combined products. Most of these, however, do not contain 100-percent pure L-arginine, but also L-arginine compounds. This means that L-arginine HCL for instance provides you with only 80 percent and L-arginine AKG with only 70 percent of pure L-arginine. The remaining 20 to 30 percent are based on compounds such as hydrochloride and alpha-ketoglutarate. The compound L-arginine ethyl ester contains even less than 50 percent pure L-arginine. ARGININE ZERO not only provides you with the strongest and most highly dosed form of L-arginine, but also with the essential vitamin B6. Vitamin B6 is required for the normal metabolisation of amino acids as well as for the normal protein metabolism. For instance, so that your body can turn the provided dietary protein into muscle protein. However, it also plays an important role in the L-arginine metabolism, as it is actively involved in the degradation and conversion process within the scope of protein metabolism, thus contributing to reduced fatigue and exhaustion. Please note: As yet, the European Food Safety Authority (EFSA) has not officially confirmed a certain effect of L-arginine. We therefore relay on the information published in journals and specialist books*. Above all, it is important that you pay attention to a well-balanced, healthy and varied diet.